R2D2 was the star of the launch. Well done Russ! Our annual Boost Glider event was a hot one with very little wind. Most members flew a glider of some sort. The Edmonds pop-pod gliders were the most popular and always perform well. We got some great hang time and may have benefitted from thermal activity at a few spots. The launch was well attended by our younger members who kept the low power pads busy all day long. 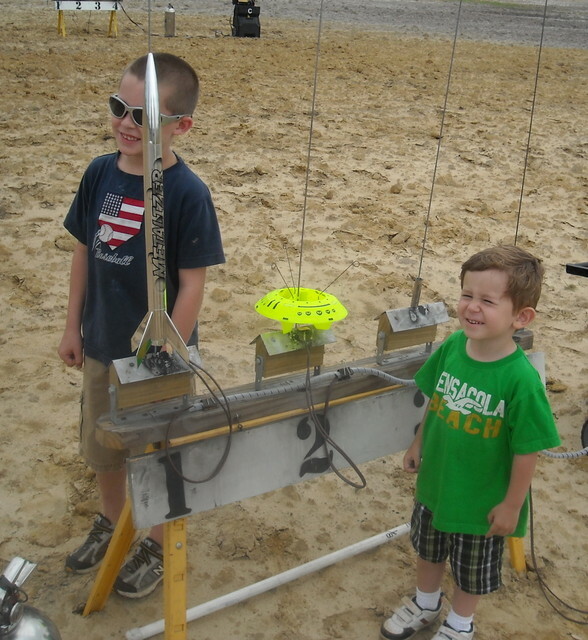 Kids always make the launches more enjoyable because their excitement and enthusiasm is contagious. Ben White had a great 2 stage flight with an Estes Mongoose. Seth’s Metalizer blinded us with its chrome brilliance. Bentley had so much fun, that his dad had to carry him away to get him to leave the launch. Alexa Stetson sold sno-cones that were greatly appreciated by all flyers suffering from the heat. Drake took frequent flyer award with 9 launches working up to E motors. William Thorne provided invaluable recovery assistance with his keen rocket tracking eyes, and saved us from quite a few long walks by fetching our rockets. Angel and Patty Huet from the University of South Alabama showed up to prepare for a student rocketry competition. We loaned them some rockets and showed them how to fly. They’ll probably be back when their project is ready for testing. Thanks to a NAR safety grant, we now have a set of fire swatters. Hopefully we won’t ever need them, but they’ll be on the trailer just in case. My 29mm mongoose flew into the sun and was not found. The (soybean?) crop is now over a foot high, and will hide smaller rockets that would have been easy to spot if they were lying on the sod. I will start flying my tracker more often and am going to get an audible beacon for smaller rockets. Photos have already been posted to the gallery, so I won’t recount who flew what; the pictures tell the story. Greg Lane’s Applewhite 54mm Stealth was the flight of the day. This huge draggy odd-roc has a slow liftoff that really amplifies the noise and smoke from the K-550 motor. Tumble recovery on a HPR just doesn’t seem right, but it works well and makes for a short recovery walk. Russ brought one of the most impressive rockets yet. It is a plastic model conversion of an F104 and had a successful flight! See more F104 pictures and the rest of the launch pictures in our gallery. We had great flying weather with no winds or rain. Many members stayed home due to the heat, but turnout was better than expected. All adult members flew at least one HPR. Our monthly event was staged rockets. Greg Lane had the LPR flight of the day with an Edmonds Cici stage 2 glider. The booster glided back as the upper stage glider powered on. Both gliders circled back for a smooth landing. My Omega disappeared in the trees making it my 3rd to be lost at Samson. The booster always comes back, so I’ll have to build another sustainer for next year. Bob Mullins launched his 2-stage Blue Goose HPR. The Goose did not want to leave the nest and it took about five attempts to get the motor lit. Ignition finally occurred and the 2nd stage lit as planned. There was a recovery failure with the booster, resulting in a core sample. Chris Short’s 2-stager flew as a boosted dart. The sustainer coasted ahead of the booster after separation without lighting its motor. Both sections deployed their chutes for a perfect recovery. I won the random draw and took home an Estes Condor ARV kit. Kendall’s Grandson, Drake, flew his 1st rockets with us. His Baby Bertha stayed pretty low on A motors. Drake worked his way up to Cs and then added a booster for a 2-stage flight that went to the edge of the field. Riley flew a Mean Machine painted in Iron Man colors. He also built a small rocket at the field with scraps and super glue. It hung up on the rod and then crashed. Tim had the highest flight of the day on his Firestorm 54. The nine grain J570 motor blasted the rocket to 7400’. John Hansel enjoyed a lazy summer day napping under his shade. He made a single flight with his ¼ scale Patriot. Tom Mac Phearson took frequent flyer award with his arsenal of scale missiles. Sea Wolf had a huge arcing trajectory to the edge of the field and Barracuda was lost again. Eldon had an interesting flight in his Magnum5. A failure at the Av-bay coupler caused it to separate under power. The pieces came down mostly intact and the rebuild will be pretty simple. Kendall had the HPR flight of the day in Nos-A-Gator. He left the gas on the trailer and used a Loki blue L1482 motor for a spectacular launch. The Space Exploration and Alien Research Society (SEARS) responded to an incident on May 8 at Green’s Sod farm in Samson, AL. This location has become famous for UFO sightings and reports of experimental aircraft activity. Numerous alien craft were identified in what can only be described as a mass invasion. A Dragonship 7 from the Asteroid Greb Sing was the 1st ship to arrive. A Colonial Viper from the Battlestar Galactica landed safely on a scouting mission. Luke Skywalker crashed his X-wing again, but managed to miss the swamp this time. R2D2 bailed out safely. Darth Vader’s Tie Fighter suffered a CATO from a defective Aerotech propulsion unit. A Venus Probe that was launched by NASA 37 years ago returned from its mission with an alien hijacker onboard. We saw a brief glimpse of a Space Invader as it was cycling its Warp9 motor. Sneaky aliens flew in a cloaked Stealth spaceship. A total of 8 Snitch saucers with aliens onboard landed at the site. SEARS president, Greg Lane, assessed the situation and determined that this was obviously a threat to all life on Earth. Unfortunately, due to recent budget cuts at NASA, we were left on our own to defend our planet. John Hansel called the FAA, and we were granted an airspace waiver. SEARS retaliated against the alien invasion by launching a barrage of missiles, fighters, interceptors and space exploration vehicles. 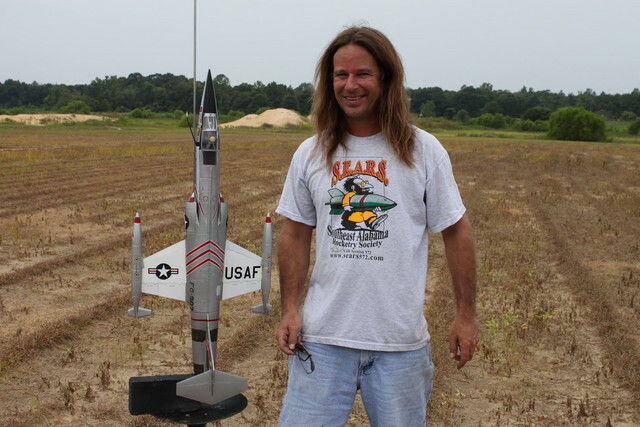 Chris Short supplied SEARS with rocket motors and had a great flight on a new AT Metalstorm. He also flew a high powered two-stage rocket that went out of sight. Tom Mac Pherson and Keith Stewart launched an arsenal of missiles from the surplus military store. Tom flew a Strong Arm, Exocet, Phoenix, and Sea Wolf. His X-15 and Satellite Interceptor were shot down by the aliens. Keith flew a Phoenix, Falcon, and an AMRAAM with cow spot camouflage, codenamed MOORAM. 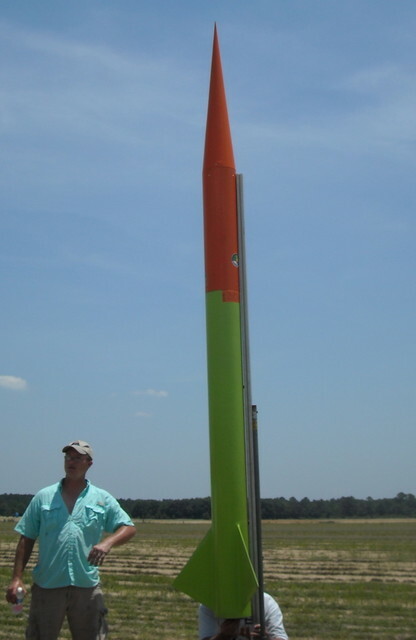 Kendall Brent flew an ARCAS sounding rocket and also released a Black Arrow fly from his quiver. I compromised my journalistic integrity and became involved with a few counterstrikes of my own. Starbreaker left a sparkly trail of comic debris in its wake. My E class Interceptor engaged its Warp drive and never returned from its mission. Brave children were recruited to help stop the invasion. Seth Jackson flew a metalizer and a Sting Ray. Bentley Kelly orchestrated many of the Snitch landings and was chosen by random selection to build more aircraft for the SEARS arsenal. Bentley, please come out to our next event to claim your prize. Bentley’s dad, Kerry trained the young cadets and flew a Reliant, Clipper and Sizzler. Marty Wiggins flew a Maverick fighter and a Snarky drone. His Shuttle Thang launched 2 space shuttles from 1 booster, a great solution to the NASA budget cuts. Randy Wiggins tried to obliterate their planet with a Big Nuke, codenamed Big Red. The flight did not go as planned, and failure analysis will surely show that the crash was caused by alien sabotage of the electronic recovery system. The situation was beginning to look dire when reinforcements arrived from Tripoli Louisiana. Whitney Richard’s Little Dog barked fearsomely. Eddie Williams’ Pheonix left a fiery trail in the sky. Scott Taylor saved the day with his 65lb XST-3. Words cannot describe the exotic unconventional design of this sleek experimental aircraft, so you will have to see the photos in the SEARS gallery. This spectacular flight was an awesome show of force that caused the aliens to call off the invasion. The weather was perfect and the winds weren’t too bad. We only had 10 flyers, but we made 51 flights. All flights were recovered on field. We flew motors ranging from A to L with everything in-between. D motors were the most popular because there weren’t many small rockets flying C motors. The monthly event was Peep lofting with 18 spot landing attempts. Peeps were skewered on Snitch landing gear. Peeps were ejected from Cluster Bombs with some being lightly toasted before they could bailout. Ben White used his Estes Omloid to safely transport Peeps in an enclosed capsule. Roy Houchin made the flight of the day with an excellent Booster Vision launch recording a Peep flight. Look for the video to be posted soon. I lost track of who landed closest to the target, but Greg won the random prize draw. It was a bad day for Peeps; those that survived their flight were devoured by hungry rocketeers. It was a great day for mid and high powered rockets. Greg Lane’s unfinished Firestorm 54 is transparent which makes it easy to check for recovery devices before liftoff. Plenty of BP made sure that the chute was deployed for a soft landing. John Hansel’s Ultimate Endeavor was late with its deployment events, but responded to his voice commands for a perfect flight. Marty Wiggin’s Thunderbird launched with lightning speed on a high impulse Blue Thunder motor. Randy Wiggin’s Arrow 4 had trouble lighting the Green Gorilla motor, but a sliver of Blue Thunder added to the igniter gave it the extra kick that it needed. My upscale Orbital Transport put on a great show, but the mother-ship suffered a hard landing at the flightline. It will go back to the hangar for repairs and a chute upgrade. Rick Gutkvecht’s flying disk had an unstable flight that was quite interesting. Eldon Triggs dialed in the Tuskegee Univ USLI rocket getting closer to the 1 mile altitude goal. Keith Stewart took the frequent flyer award with 11 successful launches. He has a beautiful fleet of classic clones and upscales. These are all finished to catalog perfection with the correct paint scheme and decals. His X-15 was the first that I have ever seen make a stable flight. Thanks to John Hansel, we now have another upgrade to our GSE. He built a large clipboard with 20 clips that correspond to the launch pads. Now we place our flight cards on the clip that matches the location where our rocket is sitting, which makes the LCO’s job easier. Come on out to our next launch, and see if we can fill up the clipboard. SEARS held its monthly launch on March 13 at Green’s Sod Farm. It was too windy to fly rockets but some of us were brave (foolish) enough to try anyway. Saucers and streamer rockets were good choices. The monthly event was Maiden Launch. Rick Gutknecht won the draw with an Applewhite Flying Disk. This little paper saucer flies on an E motor and tumbles down. The Samson TARC team continues to improve their design. They used a triple D-12 cluster in a BT-80 rocket with enough streamer to rope off a crime scene. Richard Crews grilled burgers and dogs to raise funds for the team. Tom MacPherson was undaunted by the winds and took frequent flyer award. His mid-power fleet barely stayed in sight on F and G motors. An Aerotech Barracuda was the only casualty to the winds. It was last seen drifting towards the Gulf of Mexico to join other fish of its namesake. Tom achieved NAR L1 with a Madcow Seawolf. It weather-cocked at liftoff which made it look like a real guided missile. Going over the flight cards, It seems we have neglected other recent certification recognitions from previous launches. Gabe Doering achieved NAR L1 and L2 on the same day in his “Dr Evil” LOC Minnie Mag. I guess he couldn’t fit an M motor in it. Andy Mosely achieved L1 on a Giant Leap rocket. Nicholas Hall achieved L1 on a PML Ariel. Bruce Heath achieved L1 on a Performance Little Dog. He also set a PD record with an oversized chute on this flight. Tim Morgan has quickly progressed to L2 in preparation for USLI competition. Congratulations to all and welcome to the club! Greg Lane flew a nice assortment of saucers. Riley Worring flew his Estes Outlaw several times switching from a chute to a streamer after its 1st flight. 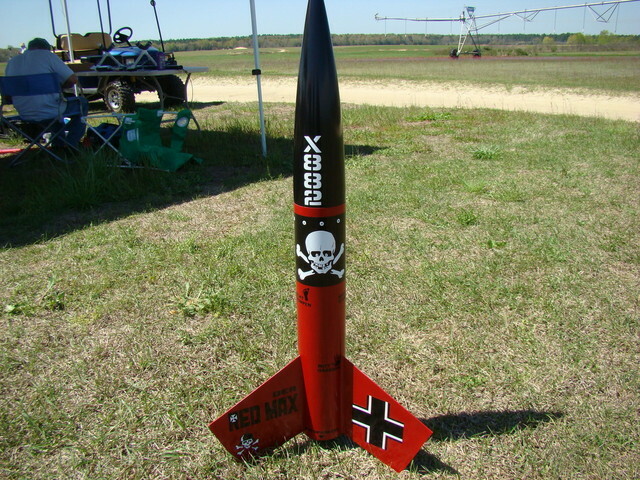 Randy Folts flew an Estes Star Striker. Marty Wiggins flew an Estes Big Daddy. Bill Bosely flew a Quest Penetrator. I flew some odd rocs and streamer rockets. My DD Mean Machine reached 2771’ on an H motor. Chris Short flew the flight of the day in his Auburn War Eagle. Richard Crews transported all the spectators along with the 20’ tall rocket to the away cell in his limousine. Loki Research provided a sparky M demo motor for propulsion. The flight was spectacular and recovered safely on the field. The Feb 20th SEARS launch at Green’s sod farm was the best launch that we’ve had this year. We had clear skies, cool temperatures, and no wind. We had many new flyers, HPR certifications and student teams. I am writing this from memory, so please forgive me if I forget to mention your noteworthy flights. Our monthly event was egg-lofting. [Disclaimer: many eggs were harmed in the pursuit of science. Please skip this section if you have an aversion to scrambled eggs] Greg Lane won the C motor duration event with his classic Eggstravaganza. At least one egg survived for over 20s. Greg’s Dueces Wild BT-70 upscale flew with 2 eggs. Ben White came in 2nd with a 16s flight in an Estes Omloid. Dr Roy’s Quest Courier had a ‘chute failure that resulted in a scrambled mess, but his open cockpit Cluster Bomb configuration turned in some nice flights. There was a safety issue regarding lack of a helmet on the eggstronaut, but the RSO allowed it since we did not have a sharpie handy. The Samson TARC team flew their egg-lofter design which has not been named yet. It’s a BT-80 rocket with fiberglass fins that they cut themselves. They achieved good times with a ‘chute, but need to keep working towards this year’s streamer requirement. The AL USLI teams had successful HPR launches with their big projects. These college teams do math and try to figure out what motor will get their rocket closest to 1 mile. Once they get that dialed in, they will deploy a scientific payload during the contest. The winning team gets prizes and scholarship money. They all have a great chance at winning. There are no additional points for style, but I shall award flight of the day to the team that flew the Loki “L” Moon-burner. This is probably the worst motor for this type of competition, because it barely has enough thrust for a stable fight in a 12lb rocket but an 8s burn time is very cool. Kendall Brent flew the only hybrid in his Mad Cow ARCAS. Hybrids have a mixture of gas (N20) and solid (PVC) propellant, which produce a loud long burning motor. Next month is hybrid month for the advanced flyers, so get with Kendall or Greg if you are interested, and they may be able to hook you up with some loaner hardware. FYI, the ARCAS is a sounding rocket that was used for scientific research. You may have seen the actual rocket; it was the big rusty rocket propped upagainst our equipment trailer that Dr Roy brought. Welcome new member Randy Folts, who flew a sweet Estes Alpha. John Hansel’s PML ½ scale Patriot on an L motor. Perfect flight. John Stein’s Estes Saturn V on an AT F motor W/ bonus dely. Deployment at 20’ AGL almost gave me a heart attack. Greg Lane’s Pyramid on a G motor. Deployment after landing shot into the Porta-Potty. Glad it was unoccupied or we may have had to pay extra for servicing. Chris Short’s LOC Magnum CATO. Did we find all the debris? Chris Crews’ Performance Gizmo on a K motor. Somehow, he made room for a ‘chute, and it stayed up for a very long time. Marty Wiggins’ scratch Shuttle Thang. Awesome hang time from both gliders. Cliff Oliver’s BSD Thor. Can I have that rocket when you get tired of flying it? Rick’s Applewhite Bumble Bee monocopter. We need to start calling “Heads down” instead of “Heads up”, but still no decapitations yet. Gary’s Crazy Chicken featured a rubber chicken for a NC. He doesn’t like long recovery walks, so he made land in his chair. Thanks to Russ Roberts for writing this report! SEARS572 held its monthly launch on 9/12/9 at Green’s Sod Farm in Samson AL. The weather was gloomy with 50% rain prediction. This caused most flyers to stay home, but those who showed up had a great time. We had cloudy skies and 10MPH winds from the East. The wind direction was consistent throughout the day, which allowed us to pick a great setup spot. Some rockets drifted quite a bit, but all were recovered on field. Our monthly theme was Sci-Fi and Warp Factor. On 21 March, 2009, SEARS conducted their monthly club launch. The skies were cloudless most of the day as can be attested to the number of people who looked like lobsters come the end of the day. Temperatures were cooler than most had expected but most of us survived wearing T-shirts, I don’t think the temperature got much into the 70s F. The wind was another matter. When we set up the launch pads at a little before 0900 the winds were light and out of the east. As soon as the range was set up the wind picked up and blew any where from out of the east to out of the south. I think some of the early launches of C and D motor rockets landed in the sand pit and we were set up east of the Porta Potty location. Those of us wanting to fly larger and higher projects waited until about 1600 to fly. By then the wind was backing off and mostly out of the east. At altitude the wind were much less than they had been all day. There was a real rocket festival of large projects the last hour or so of flying time. There were eighteen fliers listed in the flight cards and that does not include the Auburn and Tuskegee University’s USLI teams. There were 3 Cluster flights, one staged flight, 12 flights turned in on Green Flight cards and 8 turned in on Yellow fight cards. These numbers are included in the listing above. We shut down flying about 1745 hours and managed to pack up before dark, where a number of us went to Crews Bar-B-Que and told stories of our rocket accomplishments (lied). 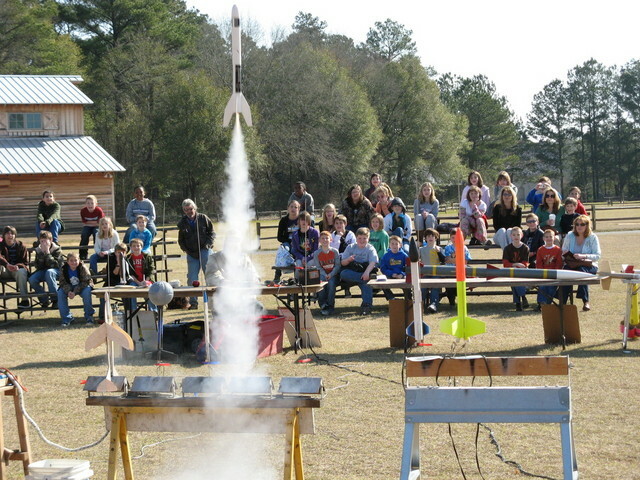 The Alabama Aerospace Week rocketry demos at Landmark Park near Dothan were enjoyed by several hundred enthusiastic students over the course of four days. Each student got an introductory lesson in rocket science through a talk about forces and watching actual model rocket launches. We hope some will pursue careers in science and engineering. There were many home schoolers among them. Several parents expressed interest in having their children get involved with rocketry to get a feel for engineering before they head for college. Thanks to SEARS members making this possible including Randy Wiggins, Marty Wiggins and Tom MacPherson. The R/C folks put on an excellent show as always. Ft. Rucker flew in a helicopter. This is always a rewarding event. We look forward to next year. You can see more pictures at http://sears572.com/gallery/2009-02-24. You are currently browsing the archives for the Report category.